Looking to kick back and relax while you’re out exploring the wilderness? You can’t beat the feeling of chilling in a hammock as you lay down and watch the stars overhead while being as close to nature as possible. Now, when it comes to buying such a great piece of outdoor furniture, you’re probably not sure where to start. With so many hammocks readily available, how do you choose the right one? This takes a ton of research to figure out what you should be looking for in a hammock, what different levels of hammocks have to offer, and what you’re able to compromise on in order to get the best hammock for you. This article aims to lighten the load by reviewing one of the more popular camping hammocks currently available on the market, the isYoung Hammock. By the end of this review, you should have a clear understanding as to whether or not this is the right one for you. isYoung is a diverse company selling not only outdoor products such as camping gear, but they also sell a large variety of pet products and car accessories. While their product catalog is rather varied, it is clear that isYoung has one goal, and that is to offer quality products at affordable prices. The isYoung Hammock is the perfect example of this. Not only will you find all of the fundamentals that you’d look for while trying to find your perfect hammock, but you’ll find them at an incredibly affordable price. This hammock is great for the more budget-conscious among us as well as those who aren’t experienced enough with camping hammocks to invest in the higher tier models quite yet. This is also the right hammock for anyone who is looking for a good level of convenience as this hammock couldn’t be easier to unpack and set up, thanks to its pop-out design and intuitive strapping system. 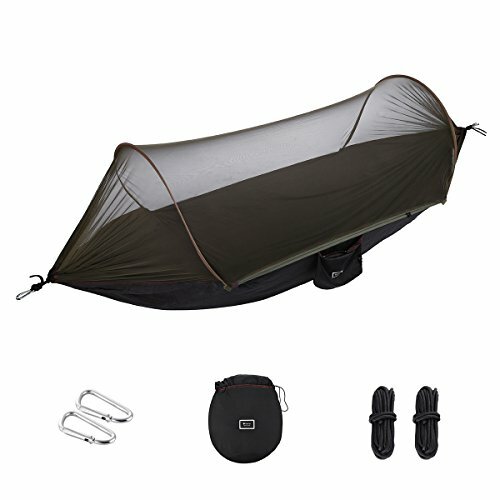 Thanks to its size and relatively light weight, this hammock can easily be transported between destinations and can even be clipped onto the exterior of your gear bag to free up that little extra room. Buyers will receive the hammock itself, which comes with a built-in mosquito net, as well as two solid steel carabiners and the appropriate securing ropes. Sleep Space: This hammock offers surprisingly more space than you would first expect, measuring in at 114.2 by 57.1 inches. This means that you could quite happily fit multiple users in the hammock at once. Construction: The hammock itself is made from 70D parachute-grade nylon fabric, which is much softer to the touch and more breathable when compared to the more commonly used 210T nylon. Not only is the 70D extremely durable, but it’s also antibacterial, which helps prevent any mildew buildups. Hassle-free Setup: The hammock uses two ribbed arches to support the mosquito net, which makes it quite easy to set up. It also allows for a pop-up unpacking system, which lets you get your hammock up and going in an incredibly short period. This feature also transforms and doubles up the hammock into a mosquito-protection tent. Maximum Weight: Thanks to its design and construction, this thin and lightweight hammock can support a surprising maximum weight capacity of 440.9 pounds. When it comes to how it is used, hammocks are extremely instinctual pieces of outdoor furniture. The isYoung hammock, however, is even simpler. In order to get this hammock set up for the evening, all you need to do is to remove it from its travel bag and lay it between the selected supporting trees. The hammock will then spring into shape and users can simply fasten the securing lines at head height to allow for an appropriate amount of slack. It’s important to note that tree selection is extremely important too, and you’ll typically want to choose two trees with a gap of eight to 10 feet. The trees should also have a diameter of at least 15 inches, letting you sleep safely knowing the tree won’t simply collapse under the strain. When looking for the perfect hammock, you don’t simply want to stop on the first one you find. Take some time to look at a variety of hammocks across a variety of price points. This will help you getter a better understanding of what is available as well what features best meet your own needs. For those who are looking for a little extra from their camping hammock, you might want to take a look at the Everest Double Camping Hammock. It not only offers a fantastic amount of space but also uses superior materials throughout its construction. This includes a ripstop diamond-weave 210T taffeta parachute nylon and a heavy-grade and high-density polyester mosquito net. Anyone who loves the convenience and ease offered by the isYoung but also wants a little bit more from their hammock should take a look at the ETROL Camping Hammock. This hammock offers a so-called fast-swap feature. This feature allows you to simply rotate the hammock to 180º when you don’t want to make use of its mosquito net and lounge out in the open air. It also uses the same durable and breathable 70D parachute nylon but boasts a much more durable set of tree straps. It comes with a lifetime warranty too. The isYoung Camping Hammock is an incredibly convenient and easy-to-use hammock that is great for outdoor enthusiasts of all levels. This product will especially suit those who are looking to spend less time setting up their hammock and more time relaxing in it.